Yesterday we received the very sad news that E-Dressage had been forced to close after problems with a particular company. I won’t go into the details, but instead will celebrate everything E-Dressage has done for me and others. Despite there being several other online dressage companies out there, E-Dressage offered something a bit different. They strived to not only offer you the best classes, but the best feedback from BD judges in the form of your feedback sheets and videos from the judges. They also had an extensive training vault full of videos and articles to help you improve your schooling and a monthly magazine, all part of their fantastic membership deals. Their members always came first. E-Dressage allowed me and Scottie to compete every month against other ex-racehorses, where the competition was a little less intense, building our confidence and giving us some gorgeous rosettes. We also got the chance to create a team with other members, growing closer and working together. 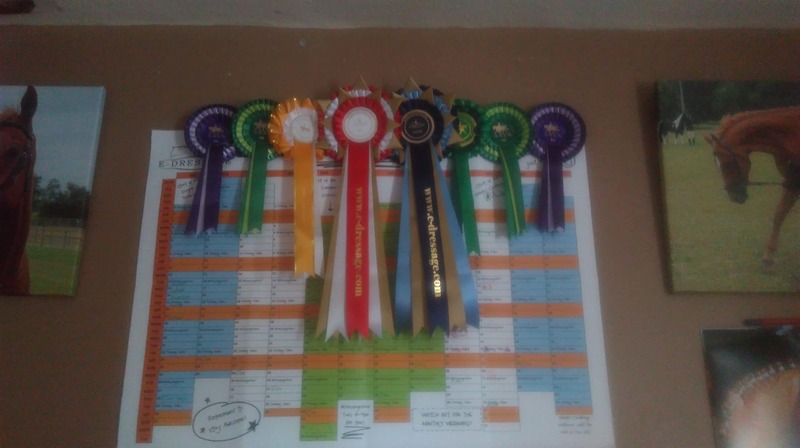 During these 16 months our scores and schooling improved massively and we made the move up to Prelim where we have been competing and improving ever since. We placed 15th with 62 points in the Rider League. I was aiming for top 20 at the end of the year, so very pleased with this, even if we never got to finish. Our Team Miss Matchy placed 11th overall with 689.12%. Me and Scottie also managed to make up 3 of the scores in the top 10, making our team percentage. I am still unsure as to whether we will explore other online dressage companies. I almost feel like this stage of our dressage career is over and perhaps this is the perfect chance for us to start focusing on other things. Scottie behaves impeccably at dressage competitions. So maybe the end of e-dressage will give us the push we need to compete more in the real world and start spending more time working on our jumping. I hope those who worked extremely hard behind the scenes at E-Dressage find something even better to work on in the future and that everyone who loved the service as much as me finds something just as good to do with their horses. December is for Dressage and other news!